The soft palate is a movable muscular flap, which hangs downwards from the posterior margin of the hard palate into the pharyngeal cavity. It divides the nasopharynx from the oropharynx. The soft palate can be easily distinguished from the hard palate at the front of the mouth since it does not contain bone. Anterior (oral) surface is concave as well as indicated by a median raphe. Inferior border is free and creates the anterior boundary of the pharyngeal isthmus. A conical, small, tongue like projection hanging down from its middle is referred to as uvula. In the submucosa on both the surfaces are mucous glands, which are in loads around the uvula and on the oral aspect of the soft palate. The mucosa on the oral surface of the soft palate also includes some taste buds (particularly in children) and lymphoid follicles. It’s a protective reflex demarcated by the elevation of the palate and contraction of the pharyngeal muscles with related retching and gagging in response to stimulant of the mucous membrane of the oropharynx. It takes place when the palate, tonsil, posterior part of the tongue, or posterior pharyngeal wall are contacted by unknown things like swab, spatula, etc. The afferent limb of the reflex is supplied by the glossopharyngeal nerve and efferent limb by the vagus nerve. Flattening of the palatal arch on the side of the lesion. 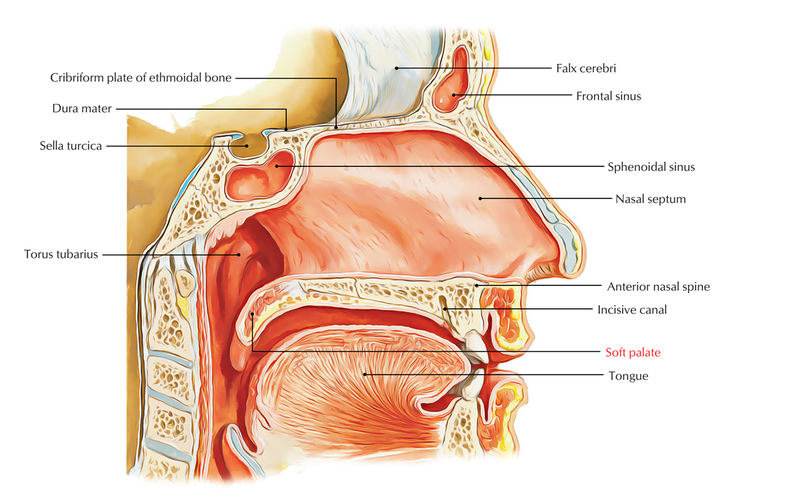 The inferior aspect of the soft palate creates the upper part of the oropharynx and is the location of the where most of the soft palate cancers occur. The superior surface of the soft palate i.e. portion of the nasopharynx, is rarely a primary site of neoplasm formation. The soft palate has a substantial amount of minor salivary glands. These glands act as the location of origin for non-squamous neoplasms of the soft palate. A soft palate tumor can extend anteriorly as well as also encompass the hard palate. Perineural extend also appear superiorly inside the pterygopalatine fossa alongside the greater as well as lesser palatine divisions of the maxillary nerve. Via the inferior orbital fissure along divisions of the maxillary division of the trigeminal nerve inside the orbit. Via the foramen rotundum inside the central skull base. Via the nerve of the pterygoid canal inside the facial nerve and temporal bone. Both the trigeminal and facial nerves palsies can appear due to this perineural spread.